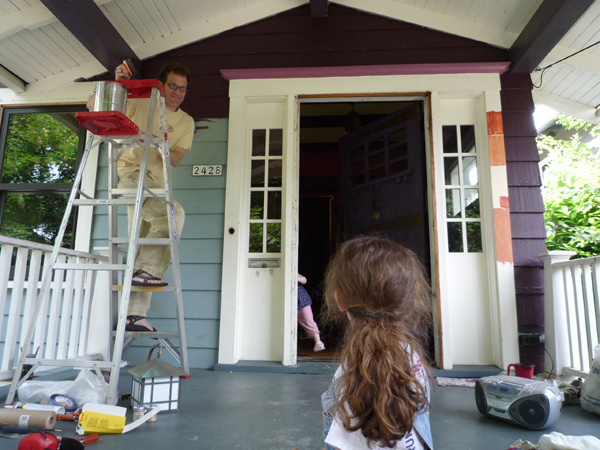 Painting the Bungalow – We’ve got a body color! So, it seems we’ve settled on a non-authentic bungalow body color! Since the depth of color is similar to the dark stain on Craftsman Farms, we’re viewing this as “a modern interpretation of the Craftsman Aesthetic” with apologies to purists everywhere. great coverage for a first coat! Mr. Bungalow Insanity – that’s good! Paint the house. Looks like you have a Karate Husband in training. That color looks superb and very crisp on the cedar shakes. Looking forward to seeing the whole palette! Ooh, I like it! 🙂 I look forward to seeing the finished product! Your new colors look very nice. I’ll also say this….I’m a purist, but I think what people call “authentic bungalow colors” today are not all that accurate. 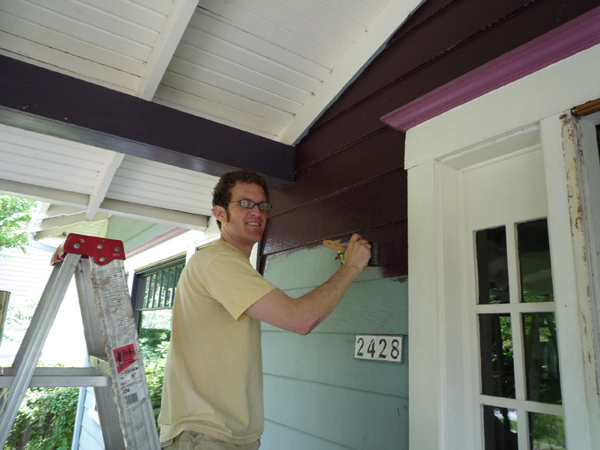 The colors deemed “authentic” are never seen on vintage bungalows in my city (except by those that have just painted). So, I wouldn’t worry too much about it. Go with what looks good. I’m a firm believer in doing what will make you happy in your home and worrying about authenticity after that– granted, I wouldn’t be okay with painting the house neon green, but then again I’m not sure I’d be a Craftsman lover if I were the kind of person who wanted a neon house, ya know? Anyway, it looks great and is keeping with the spirit of authenticity, if not the exact letter of it! LOVE the color! Scraping on my place starts Tuesday, and this post makes me even more excited to see progress. It’s been a long two months already! Your place is going to be GORGEOUS–what a change from the blue! !